Play video Ballon d'Or: Messi, Ronaldo, Neuer?Ballon d'Or: Messi, Ronaldo, Neuer? Play video Ballon d'Or: Messi, Ronaldo, Neuer? As the stellar names of the footballing world presumably trot off into the Zurich night for a glass of red wine, it is time for us to disappear too. And make sure you keep across the BBC Sport website later today and tomorrow for all the rest of the Ballon d'Or round-up. See you later! Toni Kroos on Twitter: A great honour to be in the #FIFProWorldXI! I wanna thank all my colleagues @fifpro for their vote! Trawling through the list makes interesting reading. For some it is a case of national or club pride, for others it is about picking the obvious option. Belgium skipper Vincent Kompany sits in the former group, picking compatriots Thibaut Courtois and Eden Hazard as his one-two. So does Uruguay captain Diego Godin, who picked his former Atletico Madrid team-mate Diego Costa. Unsurprisingly, Wales skipper Ashley Williams picked Gareth Bale, as did his boss Chris Coleman. Manuel Neuer on Twitter: Great evening for German football. Ralf Kellermann and Jogi Löw Coaches of the Year, Nadine Kessler Women's World Player of the Year, me in the top three. Thanks to all who voted for me and best wishes to the winner, Cristiano. Barcelona president Josep Maria Bartomeu: Congratulations to the winner of the Ballon d'Or. For Barca fans, Leo Messi will always be number one. Gary Lineker on Twitter: I see that Roy Hodgson voted: 1 Mascherano 2 Lahm 3 Neuer. You have to love his sense of humour. Ronaldo and Messi are far and away the best players on the planet, how could they both possibly not be in your top 3? Tony Barrett on Twitter: Hodgson choosing Mascherano as the world's best player is interesting/confusing on so many levels. England captain Wayne Rooney was a little more orthodox than his gaffer. The Manchester United man went for former Old Trafford team-mate Cristiano Ronaldo as his number one. Toni Kroos, however, was a slightly left-field choice for second, with Gareth Bale completing Rooney's trio. Earlier I was rather scathing about Lionel Messi voting for his Argentina team-mate Javier Mascherano. But it turns out he has an ally in England coach Roy Hodgson. The Three Lions boss picked Mascherano, who left Liverpool shortly after he arrived in the summer of 2010, as his first choice. I'm almost speechless. Hodgson plumped for Philipp Lahm and Manuel Neuer as his second and third choices. No room for Cristiano Ronaldo or Lionel Messi though. Roy? Another reminder for those latecomers about the voting system. Votes are cast by the coaches and captains of all international teams - plus a selection of journalists - from the 25-man long list. But - like Bale - Chelsea trio Thibaut Courtois, Diego Costa and Eden Hazard, plus Manchester United midfielder Angel Di Maria and Manchester City midfielder Yaya Toure, were all trimmed at the first stage. The tactical voting (or stupid pettiness?) between the world's best two players continues. Neither Cristiano Ronaldo or Lionel Messi voted for the other. Ronaldo's choices were Sergio Ramos, Gareth Bale and Karim Benzema - in that order. Spot the link. One of the most entertaining tasks after the Ballon d'Or announcement is poring through the complete breakdown of which players voted for who. Last year Cristiano Ronaldo did not vote for Lionel Messi. And Lionel Messi did not vote for Cristiano Ronaldo. What about this year? Aidan Williams: Ronaldo a deserved winner, can't help feeling a bit disappointed for Neuer, been consistently brilliant lately. Ryan Lobo: Congratulations CR7 - if only he had a better national team he would have probably won a World Cup! 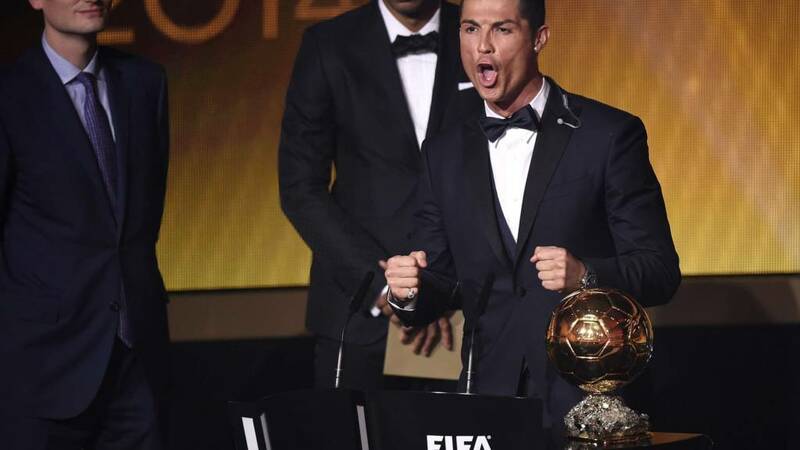 Cristiano Ronaldo wins Ballon d'Or! More from the Real Madrid superstar: "I want to continue to work as I have so far, to try and and win more titles, for my mother, for my father, for my son. To all the Portuguese people out there: I never thought that I would take this trophy back on three occasions. I want to become one of the greatest players of all time." Cristiano Ronaldo finishes his acceptance speech with a bizarre whoop that slightly sounded like he might have been saying: "Boooom"! But I could be totally wrong. His little lad appears from the crowd, toddling on to the stage, then is scooped up into his father's arms. "Ahhhh," coos presenter Kate Abdo. Cristiano Ronaldo: "I would like to thank all of those who voted for me, my president, my coach and Real Madrid. It has been an unforgettable year. To win this trophy at the end of it is something incredibly unique." Cristiano Ronaldo is a man used to taking the acclaim of a crowd - but his stage is usually the football pitch, not a plastic plinth in Zurich. He takes a moment to catch his breath, compose himself, before thanking the world for the award. Never in doubt, was it? The Real Madrid superstar bows his head and takes a deep breath as a super-super-slow mo camera captures the moment his name is revealed. Former Arsenal, Barcelona and France striker Thierry Henry, looking dapper in his bow-tie, wanders on to the stage with the golden envelope. He is tasked with revealing the winner, and is joined by Fifa president Sepp Blatter for the big moment. Thierry will give it some va va voom for sure. The moment we have all been waiting for. The 2014 Ballon d'Or winner is going to be announced. Ready? Nadine Kessler: "My heart is beating madly at the moment. I don't think I ever thought in my life I would achieve this moment. "Our club has had the tragedy of Junior Malanda and that has overshadowed everything over the past few days, we are struggling to come to terms with that. "Without my team-mates and my coach, this would never have bee possible. I have a great degree of gratitude that I must give to my family. They have seen me through all the difficult times." Nadine Kessler, the Wolfsburg and Germany midfielder, is overcome with emotion as her name is read out. The Kongresshaus in Zurich rises to its feet to applaud the 26-year-old as she walks to the stage to collect her award. Can Neuer become the first goalkeeper to win the Ballon d'Or? *Five-minute warning klaxon* We're are about to find out shortly. Pep Guardiola on Manuel Neuer: "He's the best ever in the world. He's a great, great man. He's smart, he anticipates the actions, he's very good with his feet. He controls, he dominates absolutely everything." Time to hear all the lowdown on the final Ballon d'Or nominee - Germany and Bayern Munich sweeper - sorry, keeper - Manuel Neuer. He is quizzed by German-speaking presenter Kate Abdo, before listening to a message from his Bayern boss Pep Guardiola. Colombia midfielder James Rodriguez: "I'd like to thank everybody who has voted for me. This was a very special moment for me and everybody in Colombia. I'm very happy." Watch the Real Madrid man's stunning volley against Uruguay in the World Cup quarter-final in the 'Highlights' tab on this page. Christian Karembeu, who I'm sure scored many outrageous goals in his career, opens up the golden envelope. Irish striker Stephanie Roche closes her eyes and hopes for the best. "And the winner is...James Rodriguez," mumbles the Frenchman. Stephanie can not hide that look of disappointment. James Earl Kiawoin: Stephanie Roche's goal was pure magic. It is the kind of goal that surprises you every time you watch it. Brilliant. Majestic. Tom John: Robin van Persie's header is goal of the year. The improvisation and execution were unique. Never seen another goal like that. Maarlon Fernandez: James Rodriguez is my pick for goal of the year - to do that type of volley in such a match is amazing!! What Technique!! This award - named after legendary Hungary and Real Madrid striker Ferenc Puskas - is given to the player who scored 2014's most spectacular goal. Ireland's Stephanie Roche for her stunning strike for Peamount United. Netherlands striker Robin van Persie for his diving header against Spain. Colombia midfielder James Rodriguez for his thumping volley against Uruguay. Want to relive those goals again? Of course you do. Click the 'highlights' tab on this page to watch them. Middlesbrough fans - one for you. A blast from the past as ex-Boro (and Real Madrid and Sampdoria) midfielder Christian Karembeu adds a serious element to proceedings. He speaks about the world's fight against Ebola, supported by messages from Cristiano Ronaldo, Didier Drogba and Philipp Lahm. "Avoid body contact," blurts out a stern-looking Ronaldo. Not long until the winner of this award is revealed. But before that, we have time for a quick word with each of the nominees as Martha, Abby Wambach and Nadine Kessler pop on to the stage for a quick chat. Wambach talks about the forthcoming World Cup, before stepping in as Portuguese-speaker Martha's translator. An aghast Cristiano Ronaldo stares at the stage as Bastian Baker does his thing. Lionel Messi, meanwhile, is almost scowling. Don't think they're going to listen to the free CD of his that they were given in their Ballon d'Or goody bag. Time for a musical interlude. Bastian Baker, the fresh-faced Swiss popster (of course), does the honours. He enthusiastically blasts into his 'hit '79 Clinton Street' as a room full of footballers stare, less enthusiastically, at the stage. Louis Baker-Stroud: That volley from James Rodriguez has to win it for me. Doing that at the biggest stage in football takes something special! Michael Harvey: Stephanie Roche has got to win goal of the year, pure class! Lionel Messi, looking rather quizzical, is asked how he explains his feat of having scored 50 goals in each of the past four seasons. He says: "It is simply a matter of trying to improve year-on-year. This needs a great deal of help from my team mates, of course. I've always enjoyed playing football, ever since I was a boy. I try to have fun every time I go out onto the pitch." Not a hint of a smile on Lionel Messi's face as he listens to Luis Enrique's message. That all changes moments later when his footballing hero appears on screen. Maradona? Kempes? No, it is Pablo Aimar! Messi grins from ear-to-ear as the curly-haired ex-Valencia and Argentina playmaker wishes him luck. Barca coach Luis Enrique: "He does things with the ball and does them with such ease that he looks like he's playing in a school match. He's without a doubt the best player ever seen. He's also able to make assists and defend when necessary. Basically he's the complete player in every way. I hope that you carry on enjoying football, Leo." Lionel Messi is the next Ballon d'Or nominee to step on to stage, as the audience are shown a highlights reel of his year. Drew Anderson: Stephanie Roche for 'Goal of the Year'. Shows that PURE talent is alive, away from the pampered, preening few. NEGOS: For the best goal? Stephanie Roche is my favourite. Exquisite goal from her. Anyone backing Robin van Persie or James Rodriguez for the Puskas Award? Five volunteers appear to collect the award on behalf of their colleagues. One of the quintet - an elderly Dutchman whose name I didn't quite catch - takes centre stage. He reels off a four-minute acceptance speech, even thanking his missus at the end. Everyone else in the room looks bemused, even Brazil striker Martha smirks. "Each year Fifa also commends other persons or institutions for their fair play, an issue that has always been of crucial significance to world football's governing body. Fifa aims to promote the principles of fair play through projects and campaigns." And the winner is.... the volunteers. That's the thousands of volunteers who gave up their time to work at Fifa competitions - including the World Cup - over the past 12 months. Alex Haworth: Atletico Madrid win the league title, come within a minute of winning the Champions League, and Simeone isn't coach of the year. Vivek K Singh: Simeone should have been the Coach of the Year. Winning a league over this Real and Barca, don't think anyone else can do that. Legendary German coach Ottmar Hitzfeld, who is celebrating his 66th birthday today by the way, knows a thing or two about leading a successful team. So it is rather apt that he is there to hand over the prize to countryman Joachim Low. David Hickey: World XI is a joke. Most of those players picked on reputation. Where is Luis Suarez? No Atletico players? Stephen Hay: Shows how far Thomas Mueller flies under the radar. Snubbed. Darren Bradley: As a MUFC fan, I cant see how Aguero didn't make the FifPro XI (in place of Robben), let alone a nomination for the Ballon d'Or! Germany boss Joachim Low: "It is a huge honour after what's been an incredibly successful year. It's the icing on the cake - the cake obviously being the World Cup. I'm just taking this award on behalf of everybody who has taken this team to where it is. "Winning the World Cup is the consequence of lot of hard work and many good decisions. I would like to thank all the German coaches who do so much good work with the young players. They are all Coaches of the Year." Germany coach Joachim Low hails the talents of three of his World Cup-winning stars who are sat in the audience. The camera pans to Philipp Lahm, Manuel Neuer and Toni Kroos who hang intently to Low's every word. "It is a gift to be able to work with you," he tells them. He's got a marvellous head of jet black hair. He wears trendy clothes. He led his country to the World Cup. Of course the winner is Joachim Low! These are the three men who are battling for the Coach of the Year (Men's Football) prize. Italian coach Carlo Ancelotti achieved what the likes of Jose Mourinho and Manuel Pellegrini could not - leading Real Madrid to the almost-obsessional 'La Decima'. Los Merengues clinched their 10th European title by meeting neighbours Atletico Madrid in the Champions League final, but that defeat did not take the shine off an exceptional season for Diego Simeone and his merry men. The Argentine masterminded Atletico's first La Liga triumph since 1996 as they ended Real and Barca's 10-year duopoly on the Spanish league. Ralf Kellermann: "This award is an outstanding moment. I would like to thank many people. Unfortunately I've picked up an individual award for what is team sport, so I dedicate this to my whole team. I would also like to pay tribute to [Wolfsburg midfielder] Junior Malanda, who was so sadly taken from us two days ago." And the winner is....Wolfsburg boss Ralf Kellermann. The 46-year-old was on the last year's shortlist but missed out on the prize. Not this year. Humbly he praises the efforts of his team - "it's unfortunate that I've won an individual award on behalf of the team" - before paying tribute to young Wolfsburg player Junior Malanda who died at the weekend. Third on the schedule is the women's world coach award. Wolfsburg's Ralf Kellermann, Germany Under-20 boss Maren Meinert and Japan coach Norio Sasaki are the final three this year. Kellerman, 46, led German club side Wolfsburg to the defence of their European title, Germany won the Under 20 Women's World Cup under Meinert, while Sasaki guided Japan to their maiden AFC Asian Women's Cup win. Time to profile the first Ballon d'Or nominee - step forward Cristiano Ronaldo. The Portuguese forward listens intently as tennis star Rafael Nadal appears on screen to provide a gushing message against his year. "I want to congratulate you on the year you've had," says the Spaniard. "I consider your drive and desire to improve on a daily basis a fantastic example for the younger generations." Tony Cook: David Luiz named in FIFA XI? He is a woeful defender, a woeful captain and dreadfully over rated. He is hair and smiles only. Musty: David Luiz!!! Was I the only one that saw him self explode against Germany in the semi-final? Shocking decision. Aidan Williams: Time to start the undeserved list: David Luiz and Iniesta (sorry, past his best) immediately on there. Amazed Luiz got on it. Fifa president Sepp Blatter returns to the stage to pay further tribute to the 17 people, including Charlie Hebdo journalists, who lost their lives in the Paris terrorist attacks. Wonderful speech from Hiroshi Kagawa! Even the hardened of footballers will have lumps in their throats. "I'm very proud to attend this wonderful ceremony," he begins. "This is the greatest honour to be presented with this award. "In 1979 Mr Blatter was part of the Fifa organising committee of a youth tournament in Japan. Unfortunately my English has not made any progress since that tournament! "So I was sceptical about coming to this ceremony today. But my friends in Japan said I must come - even if only to meet Manuel Neuer, Cristiano Ronaldo and Lionel Messi, and bring back some autographs." Find out more about Hiroshi Kagawa's life. Fifa godfather Sepp Blatter walks on to the stage to reveal the recipient of this special prize. "He has dedicated his live to sharing the magic and drama of our sport with others. He is a former player who became a journalist whose work has the respect of many. "He covered his first World Cup in Germany 1974 and has raised football's profile in Japan and Asia. Few can match his commitment." Any ideas? Kudos is you guessed that the winner is 89-year-old Hiroshi Kagawa. Next up is the Presidential Award, who will be picked by Fifa president Sepp Blatter. It is "bestowed upon a person or institution that has made a superlative contribution to football without seeking to monopolise the limelight" apparently. The midfield cohort are asked which player from history they'd most like to have played with. Angel Di Maria says he would pick Argentina striker Mario Kempes. "He's an idol at my first club [Rosario]," he says. Andres Iniesta picks ex-Barcelona midfielder Michael Laudrup was his childhood hero. "A shame I never got to play with him," he says. Some of the members of this year's back four are asked which defender they idolised growing up. Philipp Lahm picks AC Milan and Italy legend Paolo Maldini. "A sensational footballer, a great personality and an all-round legend, not only in Italy but a real idol," he says. Sergio Ramos says he'd go for Maldini as well! "A reference point for any defender, his positional play was quite magnificent," he explains. Can you imagine standing in the opposition half looking over at that lot? Frightening. Can you imagine if it wasn't Manuel Neuer lining up between the sticks? Here we go. Time to find out which 11 men are named in the best XI of 2014. Before we get stuck into the awards, there's a quick reminder of the spectacular goals which are nominated for this year's Puskas Award. Ireland's Stephanie Roche is battling Robin van Persie and James Rodriguez for the award, which is down to a public vote and will be announced in little over an hour. The three men nominated for the Ballon d'Or - Lionel Messi, Manuel Neuer and Cristiano Ronaldo - walk onto stage, paired up with the trio vying for the Fifa Women's Player of the Year prize. They are, of course, Martha, Abby Wambach and Nadine Kessler. All six shuffle on to stage, are introduced to the crowd, smile rather uncomfortably, before disappearing back into the crowd. The television director pips his imaginary whistle, the cue for British television presenter Kate Abdo - tonight's host - to start reading the autocue. Game on! Ben in Northumberland: Would much prefer to see the Ballon d'Or go to Manuel Neuer rather than making it a Messi v Ronaldo contest for most in-form striker of the year. Carl Johnson in Norwich: It will be shocking if Neuer does not win tonight. World Cup Winner and he has evolved the nature of modern goalkeeping in the form of the 'sweeper-keeper'. Fifa president Sepp Blatter arrived with his missus Linda Barras earlier and is the first on stage in Zurich's Kongresshaus. The Swiss addresses the crowd in French, talking glowingly about the Ballon d'Or's French origin before offering solidarity to the nation following the Paris terror attacks. Matty B: Messi almost single-handedly dragged Argentina to the World Cup final, played in a very dysfunctional team. Still the best. The Standard Swan: Since no one else is shouting for Messi, I will. He deserves to be in the running on his footballing ability, he's unstoppable. Joseph O'Sullivan: Comparing Messi and Ronaldo on their World Cup performances there is only one winner. Leo showed up on the big stage. BBC News sports correspondent Natalie Pirks: I've seen the amazing dress! Exciting times for Stephanie Roche, good luck for the Puskas tonight. And here is the dress in question. Stephanie Roche arrived at the ceremony with her boyfriend, Bray Wanderers midfielder Dean Zambra. John Bennett on Twitter: "They said he couldn't top the red number from 2014 but Messi's delved into his colourful jacket cupboard yet again..."
On the face of it, Sir Stanley Matthews didn't have much in common with Cristiano Ronaldo. One earned £20-a-week, the other more than £300,000; one advertised cigarettes, the other models his own underwear range. But Real Madrid's Ronaldo, the current Ballon d'Or holder and one of the contenders to lift the prize again later, and the very first winner of the award, Stoke and Blackpool hero Matthews also shared key components that made them the world's very best. in Saj Chowdhury's piece comparing the two men. Tonight, we will see either a Barcelona, Bayern Munich or Real Madrid player lift that golden ball. But when it was first introduced in 1956, the winner played for... Blackpool! England's Stanley Matthews was the lucky chap to claim the inaugural Ballon d'Or, which initially honoured the European - not world - footballer of the year. It was expanded in 2007 to become a global prize. Yullaw: Cristiano: more skilful than the most skilful, more athletic than the most athletic, harder-working than the hardest worker. Michael Reid: Messi won nothing this season compared to Cristiano and Manuel Neuer. Shouldn't even be in the running this year! Any Messi fans out there? Leap to your man's defence on Twitter at #bbcfootball! Bayern Munich and Germany attacker Mario Gotze: #NeuerForBallonDor Manuel Neuer you deserve it! an initial long list of 23 players. So the question that everybody wants to know is - who is going to be named the world's best footballer over the past 12 months? That is going to be one of three men - Barcelona's Messi, Neuer of Bayern Munich and Real Madrid's Ronaldo. is the overwhelming favourite with the bookmakers to put another shiny, gold ball on his mantelpiece. Are they right? Or can Messi or Neuer help thousands beat the bookies? Don't be shy in telling us, whatever your preferred means of communication is. Tweet using #bbcfootball, post on our Facebook page, or if you still remember those almost archaic things call text messages then send one to 81111. And if you are stood next to the red carpet, and managed to grab a selfie with a superstar, then we definitely need to see the evidence. One of the first to stroll down the red carpet was Brazil forward Martha - one of the nominees for the Fifa Women's World Player of the Year - and looking very glam in a sequined silver and black dress, complete with Ursula Andress-style (continuing the James Bond analogies) slicked back hair. Fellow nominee Abby Wambach arrived moments later, shortly after an array of legends including Thierry Henry, Clarence Seedorf, Alessandro Del Piero and, er, Pauleta. The red carpet is pretty empty, apart from one or two late stragglers (who may or may not have nipped for a sharpener at the bar around the corner). Now the guests are sat patiently in the main hall at Zurich's Kongresshaus for the main event. Almost show-time. Bayern Munich and Germany goalkeeper Neuer was the first of the three nominees to arrive, shortly followed by Barcelona and Argentina forward Lionel Messi - who appears to have dug the red, shiny suit (which he wore last year) out of his wardrobe. Real Madrid goal-machine Cristiano Ronaldo saunters in a touch later - fashionably late of course - bearing more than a passing resemblance to a Portuguese James Bond in his finest tux. Hello! The great and the good of the footballing world have shimmied their way down the red carpet, stopped to sign shirts/scarves/flags, posed for countless selfies and - in Ballon d'Or nominee Manuel Neuer's case - handed out mementos in the form of a laminated piece of card to the hundreds of screaming fans begging for a moment of their heroes' time. It was like a One Direction concert down there. Industry awards ceremonies can be a mixed bag. They can be tedious affairs for those bunged on a table with suited strangers, shuffling uncomfortably in your seat as you make small talk, all the while considering whether to snaffle the last piece of crusty French bread or not. For others, they can be quite raucous as the free bubbly is quaffed at an alarming rate in a rare office outing. With the ability of an average Sunday League footballer, I am never likely to know which category a Fifa shindig falls into. But I'd take an educated guess that the chances of Lionel Messi, Cristiano Ronaldo or Manuel Neuer boozily stumbling around the darkened room in their gladrags are slim. Welcome to the Fifa Ballon d'Or 2014.